This CWDM OADM is passive device that can multiplex/demultiplex or add/drop wavelengths from multiple fibers onto one optical fiber. 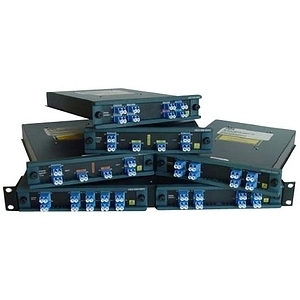 The OADM connectors are interfaced to the color-matching CWDM GBIC or CWDM SFP transceivers on the equipment side. Single-wavelength OADM are equipped with two channels traveling different network paths (east and west) to offer redundancy or protection in rings.